Have you ever experienced that excruciating pain not because you were involved in a tragic accident or had a malignant disease, but due to a failed relationship and a heart being broken? Were there times in your life when you were watching a comedy movie but your tears were falling profusely from your eyes because of heartaches? Did it ever occur to you that eternal love was just a fiction and life had no meaning? Have you ever experienced cursing your life and swearing to death because you lost faith in love? Were there moments in your life that even in your dreams you were hurting? I strongly believe that somehow or somewhere in our mortal existence, we answered those questions with a groaning YES! I must admit, I am no exception! In my viewpoint the pain that we experienced because of love or failed relationship is either inflicted by others (our partner) or a consequence of our wrong decision or choice. The hurt imposed by other people is beyond our capacity to control. What can we do if our partners purposely looked for someone else or were just too weak to resist temptations (so lame) or just simply were fallen out of love? On the other hand, sometimes it is “us” who are inviting pain to come upon ourselves. Perhaps, there were times when we knew that the relationship was wrong from the very start; and yet, we still persisted believing that love knew no boundaries and reasons; and when it failed, it dragged us to melancholy. Or, we plainly gave in to that “natural man” and unfortunately chose to hurt the “one’ we love – which sadly led us to that road of sorrow and regret! Regardless of the reason(s), we should not let our misery due to unsuccessful relationship shatter our hope and faith in love. My heart goes to those individuals, especially women, who are brokenhearted at the moment (due to a wrong choice or caused by others). I was once in your shoes, but now I could say that I am the happiest woman alive. There are a number of suggestions that I would like to share on how to mend your broken heart and ultimately help you retrace your steps to happiness. However, I would like to warn you that these are easier said than done and these might not work for everyone. Just give it a shot anyway! It is impossible to start finding your way back to happiness if you are still holding on to false hopes and dreams. If your partner is cheating on you or the other party is no longer interested to make the relationship works, allow yourself to mourn for a moment but never let heartaches and denial drown you. Immediately open that gateway to healing through accepting that it’s time for you to get going. ~ Commitment is necessary: You can never move on unless you have chosen and decided NOW that you will do so. Commit and focus yourself, even if it is difficult, to keep moving forward…YOU CAN DO IT! ~ Remember, you can only give your all if your heart is whole! You cannot find bliss in solitude. It is easier to forget your heartache if you will not do it alone! Spend time with your family. Be with people who have that sense of positivity and humor. Socialize. Don’t be so pathetic by just staying in your room and crying all day long. ~ Cease all sorts of communication: When I was still in the process of fixing my broken heart, I realized that it was extremely difficult to move forward because we’re still connected even if we were physically apart. Hence, I restricted myself from answering phone calls and SMS or responding to email messages. Also, I erased the previously received sweet nothings that were stored on my cellular phone and deleted those messages I saved in my email account for so long. Since then, forgetting the unwanted feelings and the pain was no longer a problem! ~ Note: Restore the communication only when you are no longer affected and you have already totally moved on! Do not underestimate the power of prayer. Always remember that Jesus Christ experienced both physical and emotional pain and suffering when He atoned for our sins. He can best comfort you because He comprehends what you are going through. Pray for strength that you might be able to endure the pain. Pray for courage that you might be able to forgive yourself or the one who caused you so much hurt. Pray for guidance so that you will be able to walk back to that path of joy and love without fear. Pray for wisdom that your heart will know when and to whom it should beat again. I love the saying, “What won’t kill you makes you stronger!” Gratitude always fills my heart every time I think of how I have become because of the sufferings that I went through in the name of love. Hearing ourselves or others questioning our Maker because of heartaches and despair is an unfortunate display of conviction that fall short! It is a sad truth! But, cheer up my friends! Remember, heartaches, pain, sufferings and despair: these too shall pass. Keep praying that your broken heart will soon be mended; so that when the time comes that love will find its way back to your heart again… you are ready to welcome it with a bang! One of our fave appetizers is chips and salsa :-); so here it is....hubby's homemade salsa which is very yummy! I like it with cilantro in it, but he prefers without. But when I make some, I put a little whether he likes it or not, lol! What about you? What's your fave Mexican appetizers? This is my share for Pink Friday this week; you can join us by clicking the button below! CC: He is Not a Picky Eater! One of the things I like about Caucasian is that they are very vocal with what they feel and think. It makes our life easier because they don't hide what they feel...well at least with my hubby. He tells me how much he hates it when I pluck my eyebrows or when I fry dried fish. Talking about cooking, if I can cook, he can cook, too! I might not be a very good cook, but to him..I am except when it comes to certain Filipino foods such as "Dinuguan, Kare kare, Pinapaitan, Bopis, and Adobong Atay. Well, at least he tried them first before he said "i don't like it." He loves adobo, nilaga, caldereta minus liver, apritada, menudo, tinola, sinigang and etc...He used to eat pansit, but is burned out of it. He wouldn't even touch it at all now. Noticed now, yeah, he loves to eat and he is not a picky eater either. His photo says it all, lol! On the other hand, I do the same when it comes to the food he cooks. I will try to eat once or twice of his foods, but that's about it. I love his chicken curry the best! 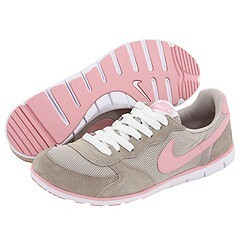 While searching for a fair of sneakers online, I found this one (see photo above). I like it for it is very cute and girly! I still haven't buy it yet, but hopefully soon or before our trip to the Philippines. Pink color really rocks! I am loving this Pink Friday meme, don't you? Missing My Husband So Much! Every time my husband goes back to work after his 3 and 4 days off from work, I couldn't help but miss him. I couldn't sleep well at night and sad. One time I asked him if he feels the same, and he said "yes." He doesn't wan to go, but he needs to. I know what he meant, it's just that I have gotten used to hanging out with him. I feel so safe and secure when he is around. The strange this is that when I sleep on his side of our bed, I would fall asleep easily, as if he is laying down next to me. So every morning when he gets back from work, he would find me there and would kiss me on my cheek saying "Honey, you need yo move a little bit so I can sleep," lol. The only explanation I can think of is: " i love my husband so much." And he loves me back the same. This man is not only my best friend, and lover but also my soul mate and companion through all eternity. And I thank God for blessing me with such a wonderful husband! With that, I am forever grateful to HIM! even after 12 years, I still miss him when he's not here. You, Gordon and 7 others like this. Farrah Coren, I am the same way. I hate being away from Bart. Tonia Being married to your best friend is the best!!! Coren Well, he did just come back home and started groping me, so now I just want him to go. Farrah Lou, I could let you borrow him for a while. Diane It's the same after 36. That means, am not the only one who misses their hubbies so much! CC: He Doesn't Like to be Tickled! There is only one thing that annoys hubby so much. When I tickle him under his armpits, both sides of his waist. The one that he really, really hates is that when I tickle him between his bottoms, lol! The look on his face when I do that is making me laugh! Imagine when you see your hubby's facial expression when he want to smile and frown at the same time! Two weeks ago, my youngest niece graduated from grade school. I wasn't there to witness it and most of all congratulate her. Anyway, when I asked what gift she wanted, she said that it is up to me. She will take it whatever I give her because she was shy. 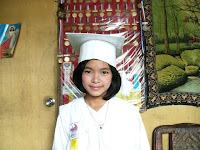 Then, I remembered one photo from her graduation day where she was playing a PSP she borrowed from her cousin. 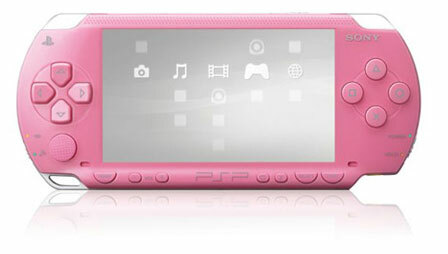 I thought that maybe if I could find a Pink PSP just like the one on the picture, then I'd buy it for her. Since this PSP is a limited edition, it would be very hard for me to find one! But I am still positive that I would get one before our trip to the Philippines this summer. The pink PSP is absolutely fabulous. The pink PSP is not only meant for games, but also for videos. With this pink PSP you surely will turn heads. There is a lot of video material which can be obtained with downloads, once you have done this you can put the videos on your cute PSP. With the pink PSP limited edition goes a white headphone, memory stick duo 32 MB, white cover and the UMD of singer Pink. First of all, I'd like to share a little bit of last week's theme that I've missed due to my busy schedule. It was all about getting ready to go out. Before, Matt used to get ready longer than I am. And it kind of annoyed me. It was supposed to be me who spend more time in front of the mirror and not him! But then 'no.' Now, he gets dress pretty quickly and for me, I need 1 solid hour to get ready and that includes taking a shower, brushing my teeth, fixing my hair, putting on light make up and trying at least three dresses before I can finally get dress. Okay, here is my share for this week them. Every once in a while, hubby and I get lost especially in an unfamiliar place or places we have never been before. But most of the time we find the right place or address when we have a direction from map quest. During those time when we couldn't find the place, I wished hubby would stop and ask someone for direction! It is annoying when he doesn't want to do anything....even listen to me when I asked him to stop and ask someone for direction! What is it in a man asking for direction? A question I always ask myself when he chose to refused my entreaties to stop and ask someone for direction. Is it because ultimate display of male arrogance and stubbornness? If it isn't? Then what!? I did some research and this is what I've found/learned. According to Alison Armstrong, the author of "Keys to the Kingdom." It is important to understand that men are NEVER "lost." To him, that implies a helplessness that he will never willingly experience. He simply hasn't gotten there yet and he has complete faith in his ability to do so. Second, from a man's point-of-view, the moment he asks a gas station attendant, or someone on the street, for directions, he has put his life and yours in the hands of a stranger! Men, wisely, only put their lives in the hands of people who have proven themselves trustworthy. The way he sees it, you are both better off searching for your location yourselves than being at the mercy of the judgment of someone he doesn't know and trust. Why has he never told you this? According to our research, this is because, to him, it is obvious. Every man already knows this and something that everyone already knows requires no explanation. It is a mystery to him why you seem to have forgotten this basic rule of survival. This is a backpack I ordered online for my youngest niece who graduated from grade school recently. A gift she could use when she enters high school this summer. I love it for it is very cute and girly as well.